The Kauffman Center is dedicated to making performances affordable for a wide-range of diverse Kansas City populations, including: students, community organizations, local educators, and military service members. As an extension of the Open Doors Community Tickets program, various ticket discounts are available for Kauffman Center Presents performances. Please note that discounts cannot be combined. More details about various Community Tickets discounts are below. Click here to see the list of upcoming Kauffman Center Presents performances. Students can purchase discounted $15 tickets in the hours leading up to any Kauffman Center Presents performance. 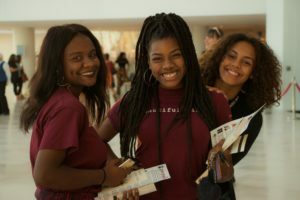 Along with the Center’s resident arts organizations, there are hundreds of opportunities for high school and college students to enjoy performances at affordable prices throughout the year. More details about each presenting organization’s Student Ticket Policy can be found below. Students can purchase $15 tickets at the Kauffman Center box office 90 minutes prior to the performance start time. Limit one ticket per valid student ID. Seating will be based on availability. Please call the Kauffman Center box office at 816-994-7222 for more information. Student ticket pricing is available for most concerts. Student tickets are $10 per student with a valid student ID two hours prior to performances. Seating is based on availability. Special group rates are available for school groups attending evening concerts. For more details, please call the Kansas City Symphony box office at 816-471-0400. Students can purchase tickets at the Kauffman Center box office 90 minutes prior to all repertory performances. Prices vary based on production. Rush prices are not valid for tickets to The Nutcracker or any other special performances. Limit one ticket per valid student ID. Seating will be based on availability. Please call the Kansas City Ballet box office at 816-931-8993 for more information. Students can purchase $15 tickets at the Kauffman Center box office 90 minutes prior to all performances. Limit one ticket per valid student ID. Seating will be based on availability. Students who would like to purchase a ticket prior to the performance night may buy one single ticket in advance at a 20% discount with a valid student ID. Please call the Lyric Opera of Kansas City box office at 816-471-7344 for more information. Patrons using this discount must present a valid educator or military ID upon ticket pick-up. Reservations made with this discount are limited to 4 tickets per transaction. Reservations must be made by phone or in person. Discount not eligible for parking or Dining Experience reservations. A group ticket discount is available for senior groups affiliated with a community organization (i.e. retirement homes, YMCAs, community centers, etc.). Senior groups of 10 or more can purchase tickets to any Kauffman Center Presents performance at a 15% discounted rate on regularly priced tickets. In addition, save $4 per ticket on fees for group reservations of 10 or more. To book a senior group at an upcoming event, call the Kauffman Center box office at 816-994-7222 or in person at the box office. Reservations must be made by an official organization representative. Please email contact@kauffmancenter.org or call the box office at 816-994-7222 for more information. To make tickets more affordable for large groups, the Kauffman Center is offering a 10% off discount on any regularly priced tickets for groups of 10 or more. In addition, groups will receive $4 off on each individual ticket fee. This discount is available exclusively for Kauffman Center Presents performances. Group discounts may vary depending on presenting organizations. To support the Community Tickets program which connects young people, families, and under-served Kansas Citians to the performing arts at the Kauffman Center, please consider donating online or by calling the box office at 816-994-7222.